Westfield Health Sheffield Hatters have made it six wins in the last seven games after comprehensively beating Cardiff Met Archers 84-30 on the road at Archers Arena. 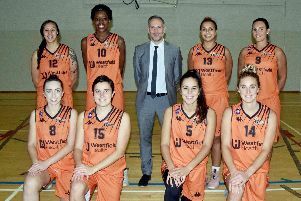 Hatters are already confirmed in third place in the WBBL Championship table, after Manchester Mystics lost on Friday night, and this win avenges a first ever WBBL defeat to Archers earlier in the campaign. The game was decided in the second quarter, as Krizstina Velkey scored seven points in a 24-4 surge to open it, with six consecutive Lauren Gregory points helping Hatters to a 36-13 lead. Sheffield’s stifling defence contained Archers to just 18 points in the opening three quarters, shooting 16% from the field, as Hatters went on to score 31 points from 22 forced turnovers, and there was no way back from there. Despite going on to dominate the game, Hatters had a faltering start. Amazingly, Helen Naylor scored all 12 of her team’s first quarter points, shooting 4-4 from the field and 3-3 at the line, while the rest of her team shot 0-13. Helen Naylor led the scoring with 22 points, including keeping her team ticking over early on. She was supported by a double-double of 19 points and 13 rebounds from Lauren Gregory. Leading scorers - Naylor 22, Gregory 19, Velkey 12was supported by a double-double of 19 points and 13 rebounds from Lauren Gregory.